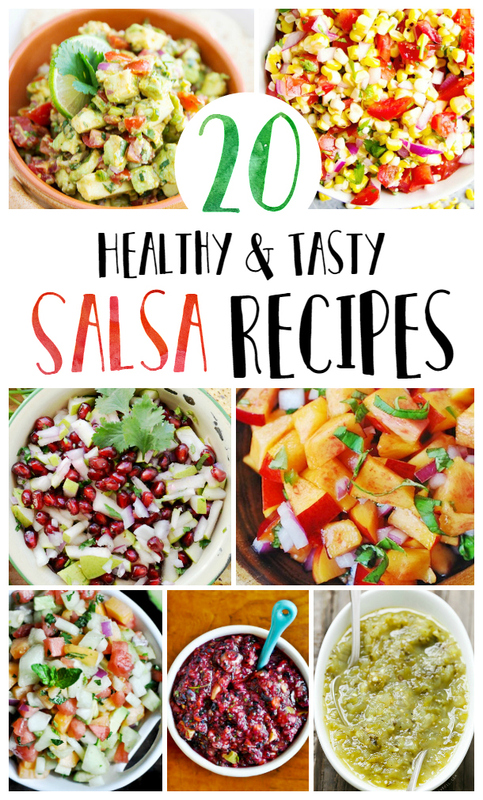 These 20 Healthy and Tasty Salsa Recipes are sure to add tons of flavor to your favorite family meals and are great served as appetizers too! Salsa is typically known as a Mexican sauce made with tomatoes, onions, cilantro and lime juice, but it can be sooo much more than that! Basically anything you can mix together and serve with different types of chips can be considered salsa. There are the traditional tomato salsas, fruit salsas, corn and black bean salsa and so many more alternatives. With Cinco de Mayo right around the corner, I thought it would be fun to make as many different versions of salsa as I could think of and celebrate with a salsa bar! I’ll basically serve a bunch of different salsas with different kinds of chips and let my guests chose what they like! Fun, right? I rounded up my favorite salsa ideas from all over the internet to share with you…and of course, I’ve thrown in my two favorite go to homemade salsa recipes too! 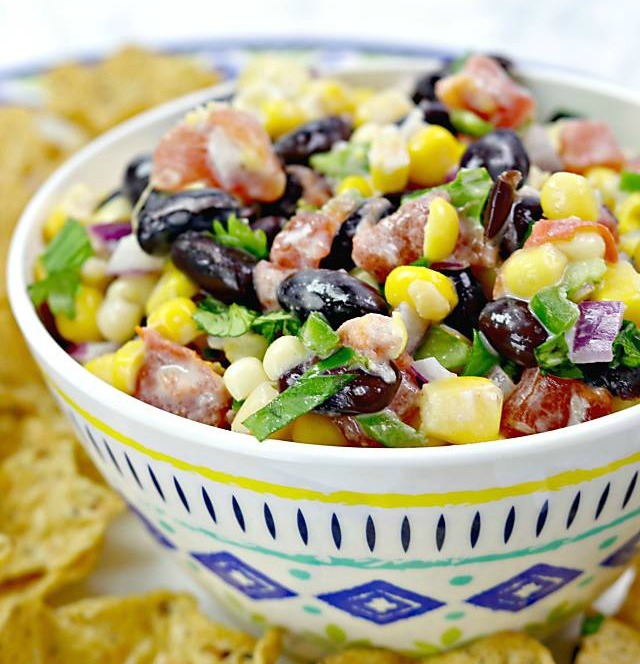 This Corn and Black Bean Salsa is hands down my family’s favorite to have with a Mexican themed meal, on taco night and is great served with tortilla chips as an appetizer at parties and cook-outs too! I promise, once you’ve had one bite, you will not be able to stop! 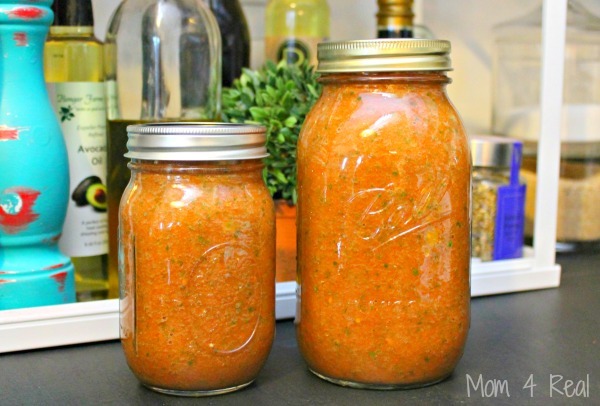 This is an oldie but goodie…my Restaurant Style Blender Salsa can be made any time of the year with either canned tomatoes or tomatoes fresh from your garden! It tastes just like our favorite Mexican restaurant’s salsa and I love to make a big batch and gift some to friends. It’s soooo good! I hope you enjoy these delicious salsa recipes! Be sure to share them with your friends on Facebook, and pin this to your favorite Pinterest recipe board! Hey Jessica! You’re speaking my language with all these salsa recipes – salsa is probably one of my fave things in the world (besides coffee!) I can’t wait to try out some new recipes for summer when produce is fresh and local. Thanks for including our Grapefruit-Avocado Salsa in your roundup! Thank you so much for including our Rainbow Salsa in this awesome list! Salsa and chips is one of my favorite snacks and there are some seriously delish sounding ones here! Pinning and checking these out!